One of the most useful online tools for home cooks has found a new home on the iPhone(s aapl). Yummly has launched its first mobile app, which brings the company’s powerful recipe and nutritional search capabilities to the handset and adds new features specifically designed to help cooks when they’re outside of the kitchen. Yummly’s app quietly went live in the iTunes App Store last Friday, but cooks had no trouble finding it. In less than a week it rose to No. 3 in iTunes’ list of most downloaded Food & Drink apps. According to Yummly CEO Dave Feller, in the short time the app has been live Yummly has already found a new audience. App users are split between existing customers registered on Yummly’s online recipe portal and new customers. Those new users may be discovering Yummly for the first time on the iPhone because the app is designed to be used in different ways than the website. Yummly’s core service is a semantic search engine that breaks down recipes into far more than a list of ingredients. It extracts nutritional data, classifies types of cuisine and can even approximate how dish will taste. For instance, it can determine that a particular Thai curry dish will be very spicy, of medium sweetness and slightly sour by examining the ingredients and cooking techniques in the recipe. But Feller said Yummly’s online portal was always intended as a recipe research and organization tool as well as stove-side aid for cooking. The mobile app, meanwhile, was built to be a food-shopping and on-the-fly dinner-planning tool. While all of Yummly’s search and personalization functions are included in the app, one of its core features is a shopping list that generates recipe recommendations from items you enter on it. It even makes uses of the iPhone’s camera as UPC scanner to log any item with a bar code. For instance, if you’re at the grocery store and see that ground lamb is on sale, the app can start surfacing kebab recipes. If you select one of those recipes, Yummly will then populate your shopping list with the remaining ingredients you need to complete it. The app’s recommendations are limited to one item for now. You can’t, for instance, put both ground lamb and basmati rice on your list and expect Yummly to return recipes including both ingredients (though you can perform a search for a recipe containing both). But Feller said Yummly plans to make the app’s recommendation tools more sophisticated in the future. As Feller has said before, Yummly’s ultimate goal is to expand beyond search to become a “complete digital kitchen platform.” Eventually, Yummly will be able to surface recipes based on your past shopping behavior. Feller said most people won’t go through the trouble of cataloging all of the food in their cupboards, but Yummly is smart enough to extrapolate what items you already have. For instance, if you bought eggs and milk in the past few days and haven’t subsequently added them to your shopping list again, Yummly can assume they’re still in your fridge. It will then recommend recipes that that include both the food you plan to buy and the food already in your fridge and pantry. As more data about food both in the grocery store and in your home becomes available, Yummly plans to tap those information sources — for instance, taking in inventory lists and expiration dates from smart refrigerators. It also plans to return the favor by offering up its own data to apps and smart appliances. 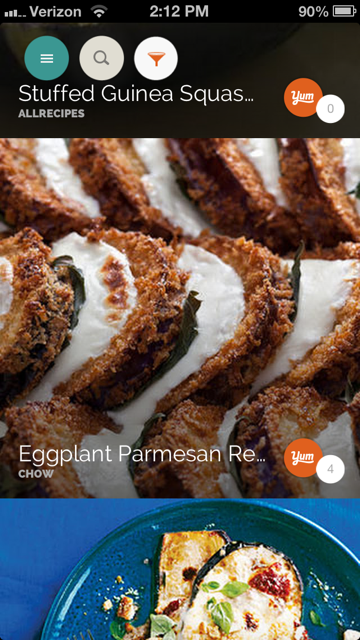 Yummly has already exposed its first APIs to other food sites and recipe services. The big goal here is to make food a part of the internet of things, a concept Feller plans to outline at GigaOM’s Mobilize conference October 16 in San Francisco. Next up, Yummly will launch an iPad app, but it currently doesn’t have plans to move to Android (s GOOG) or other operating systems, Feller said. In general, Yummly doesn’t seem to be in a big hurry to expand its reach across mobile. The Physic Ventures-and Intel Capital-backed startup took three years to launch its first smartphone app, and Feller said Yummly took its time getting that one right, even to the point of scrapping its first version of the app and starting over. Saute pan photo courtesy of Shutterstock user Fedor Kondratenko; Grocery store photo courtesy of Shutterstock user Lisa S.